The Chapel is open Monday - Friday, 9:00 a.m. - 5:00 p.m.
We regularly close for the following holidays: New Year's Day, Martin Luther King Day, Good Friday, Memorial Day, Independence Day, Labor Day, Thanksgiving, & Christmas. Exact dates of closures will be posted on the home page. 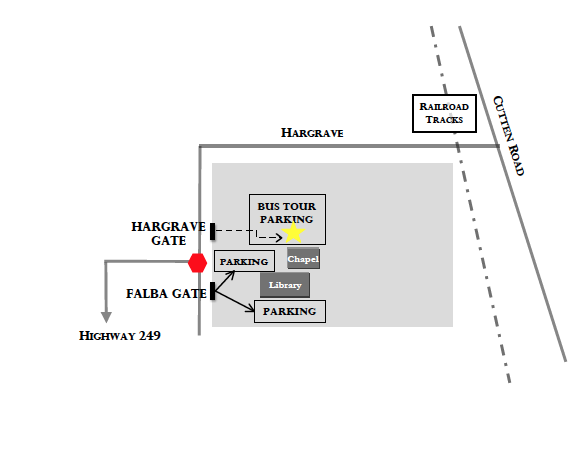 If you are coming for a library event or in a large bus for a tour, please enter through the Hargrave Gate. If you are coming in individual cars and during our regular hours, please enter through the Falba gate. When you arrive at the Falba gate, please use your cell phone to call 281-477-8400 and someone will open the gate for you.